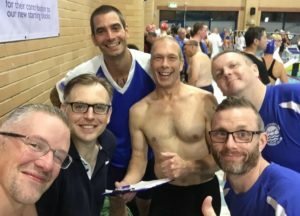 It was great to once again take a team of 8 masters swimmers to the Sussex Masters event this year, more on that in a mo!… first lets take a step back. Masters swimming has steadily seen an increase in popularity, recent studies have shown that masters swimming has seen an annual growth in membership and in events and competitions (a report in the Wall Street Journal saw a 50% increase in membership for masters swimming in the US alone). There are now local, National, European and World champs for anyone wanting to take it there. 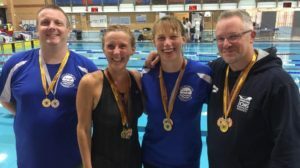 That aside, Masters swimming is not just for those who want to compete, the preconception is that perhaps masters swimming is only for ex-elite or previously high attaining club level swim athletes, who can smash out all four strokes, do a tumble turn and then rip out 50 press ups for fun afterwards…. think again… most masters swimmers, it turns out, are from a range of backgrounds and ages, many ‘masters’ swimmers are triathletes, runners, cyclists, walkers or those just wanting to get a great level of fitness back with out the pressure of needing to compete (even if you do want to compete you only compete in your age group, which see swimmers at ages ranging from 25 to as high as 85-90!). Lastly, a shameless plug… Swimming is great for muscle strength, aerobic activity and flexibility, as well as there being less chance of gaining an injury due to its low impact nature.If you feel you would like to find out more about masters swimming, seek one of us out, or talk to any coach who will happily point you in the right direction, we would love to hear from you. Dan c/o LSC Masters team.